A new batch of books just went out! Here are my picks from the new book shelf. For teachers and those of you who have an audience a bit older, I have a few new books to mention. 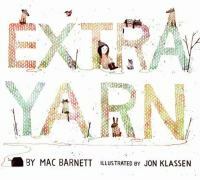 Extra Yarn by Mac Barnett is a lovely little book about happiness, and maybe magic, too. In this story a young knitter never seems to run out of yarn, but when her yarn box is stolen, the yarn disappears. Can anyone spot a familiar bear in this book? Jon Klassen’s illustrations are a perfect fit for the story. Mudkin by Stephen Gammel is a fun nearly wordless romp in the dirt. It would be a great book for classroom storytelling. E-Mergency by Tom Lichentheld plays with acronyms and letters. Baby storytimes get a boost with Big Hugs, Little Hugs by Felicia Bond, All Kinds of Kisses by Nancy Tafuri, and Animal Baths by Bob Barner. This last title is a nice little lesson in nature as well. And for preschool storytime, you’ll make the boys happy with The Construction Crew by Lynn Meltzer. This fun little book actually has a tiny bit of story to it as well as some participation. Bright colors and snappy rhyme make it well worth a place in your next transportation-themed storytime. Get creative and develop a rap with this one! 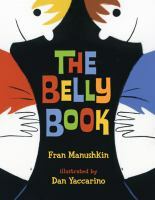 And my final choice is The Belly Book by Fran Manushkin. A celebration of all sorts of bellies, with a chance to get everyone up and bellydancing right in the middle of the book! Add this to your dance-themed storytimes for a little body-knowledge spice.